€510 per person including 1 night at Berber Camp. The traditional ‘kasbah’ of southern Morocco is the family unit of the wealthy classes and has varied forms and multiple functions. For the most part, they are country houses; the ground floor is used for agricultural purposes and the upper floors serve as living quarters in winter (upper portion) and summer (lower portion). Adjoining houses are reserved for agricultural workers. 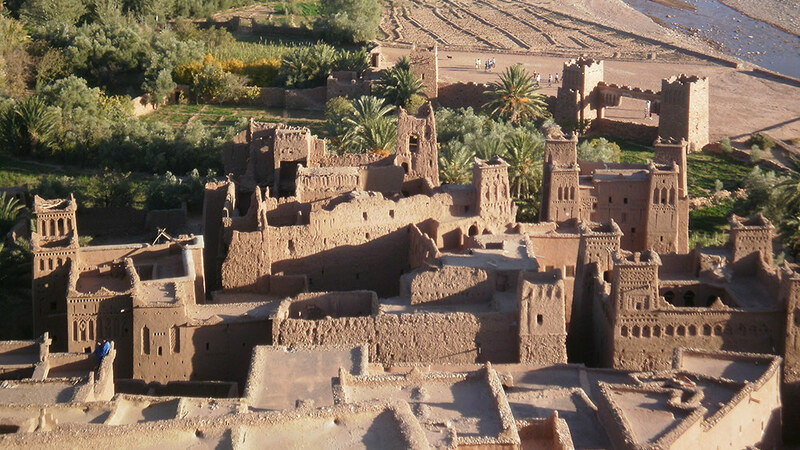 The kasbah can, however, also be a veritable palace-fortress, the seat of local power (e.g. at Telouet – it then takes on the dimensions of a small village). Camp in the desert at Erg Chebbi dunes, en-route discover the Southern Oases and their crumbling kasbahs, earth-built villages and the mountain reliefs of the Anti-Atlas. Leave Marrakech after early breakfast. 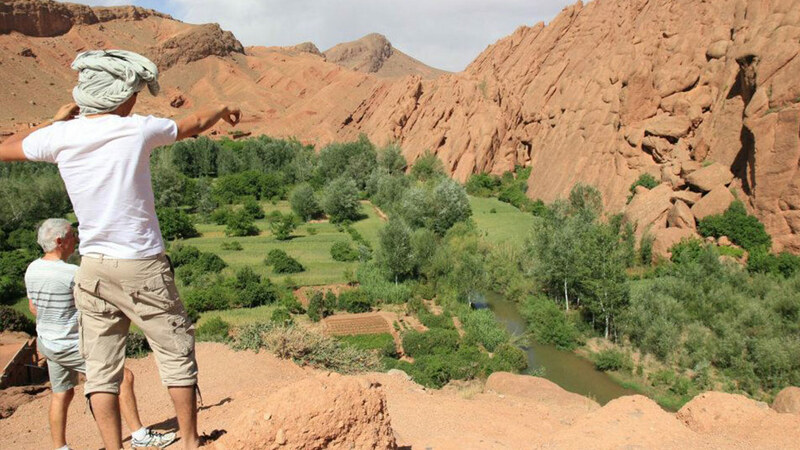 Drive Marrakech to Dades Valley. Traverse the High Atlas mountains via the highest main road pass in Morocco, at 2260m altitude, offering stunning views and exhilarating driving. 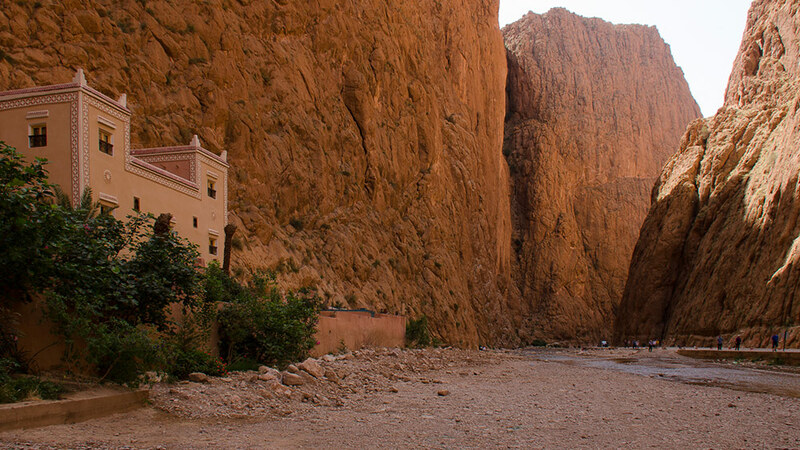 The route passes lush valleys & traditional adobe Berber villages by the road-side. 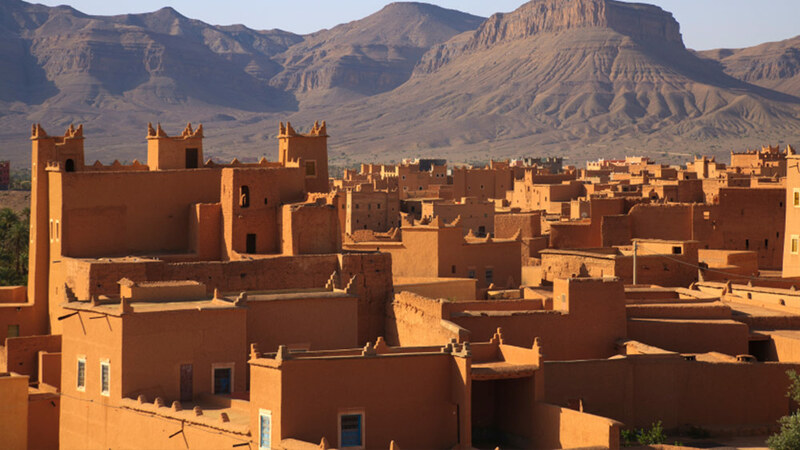 Take time to visit the UNESCO Site of Ait Ben Haddou, before Ouarzazate. 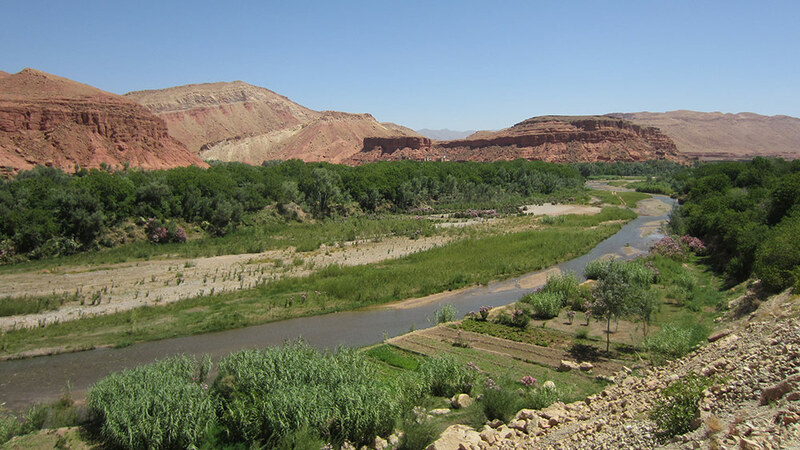 North-east of Ouarzazate start to follow the Dades River, which charts the self-titled “route of a thousand kasbahs”. North of Boumalne Dades, the Dades River winds its way through a lush valley, dotted with ruined kasbahs on vantage points and surrounded by the most unusual rock formations and cliffs. The valley becomes ever narrower until the river carves through the spectacular gap of the Dades Gorge. Overnight in a traditional guest-house in the Valley. 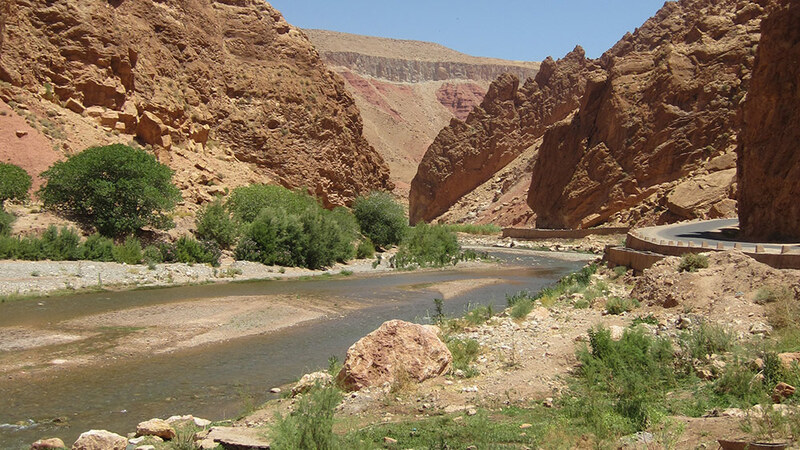 Drive Dades Valley to Merzouga, frontier to the Sahara, via the Todra Gorge (another striking natural canyon cleaved into the Atlas mountains, by the Todra River). Option to stretch the legs and walk. After lunch continue towards Merzouga, near the end of the sealed road, with the expanse of the Erg Chebbi dunes visible. Your driver will drop you at the meeting point with your camel caravan, outside of the hottest time of day, and you will trek on camel back for approx. 1 – 1.5 hour to reach the Berber desert camp in time for sunset and home for the night in the dunes. Take an evening meal and then enjoy star-gazing from the dunes. Wake to watch the desert sunrise (optional! ), then take breakfast, before trekking out of the dunes by camel-back to rejoin your vehicle. 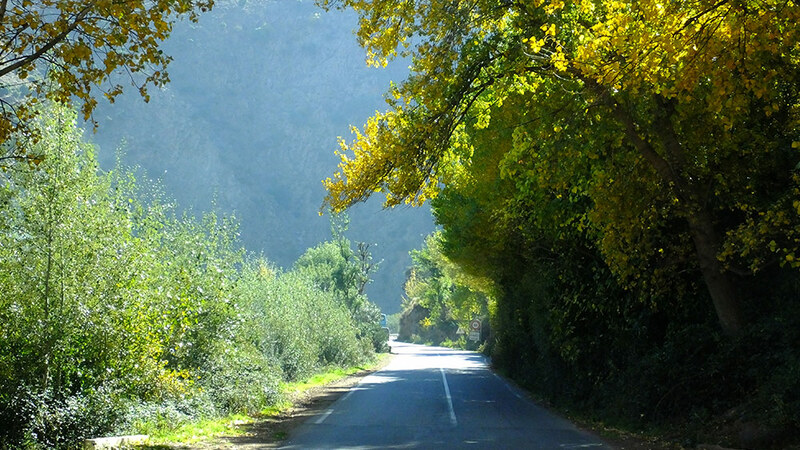 Today, take the road westwards to join the course of the magnificent Draa River valley. Your route today passes through the Anti-Atlas mountain region of the volcanic Jebel Sahro, before joining the course of the lush Draa valley (flanked by vast palm oases, crumbling kasbahs, and imposing mountain ridges). 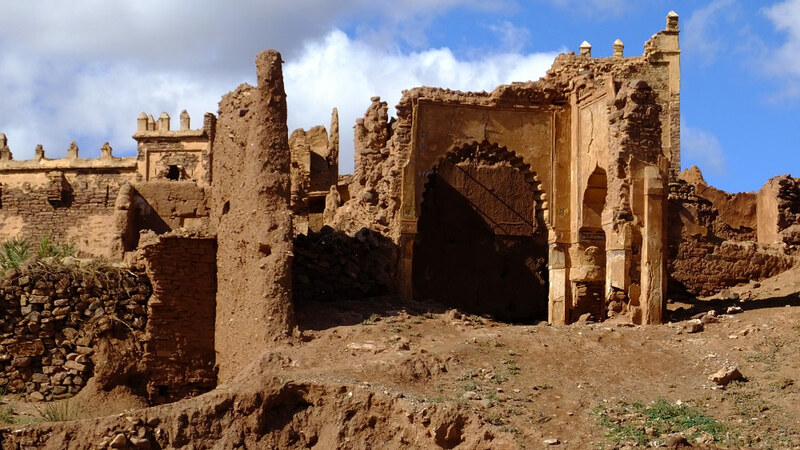 A short distance along the Draa (southwards) brings you to your overnight guest-house at Zagora (built in the style of a desert kasbah), in the palm grove of Amezrou. After breakfast, follow the course of the Draa Valley northwards. Take time to visit the ksar (earth dwellings) at Tamnougalt near the town of Agdz. This willl be the ideal opportunity to buy dates direct from the source, there is a souk at Agdz. Leaving Agdz and the Draa behind, you gain altitude to cross the outer reaches of the Anti-Atlas mountains, via some dramatic scenery. Thereafter, descend to Ouarzazate and re-join the main road across the High Atlas mountains back to Marrakech, per day 1. Expect to reach Marrakech late afternoon. guided camel-trekking to and from the camp (approx. 1 – 1.5 hour’s trek each way).